Belgium can be a bit of an outdoor-cooking wasteland. When the sun comes out everyone does love to run out in the back yard and blacken some meat, but it is rarely taken seriously and is never combined with the idea of high quality food. Often if I talk about cooking a very nice cut of meat on the grill I get the response “Aww, thats a shame.” Because of this attitude it is rare that Belgium offers something unique to the outdoor-cooking world. Perhaps it was born from a pure marketing idea or perhaps it came from a genuine search for new flavors, but never the less, woodchips made from Gueuze-barrels is an interesting and uniquely Belgian product. I was surprised to find these wood-chips but I was flabbergasted that they were at my local grocery store, not some obscure online barbecue specialty store. Peter De Clercq, Belgiums one and only outdoor-chef, has been trying to bring grilling to a higher level here and is the man behind this new idea. Thanks Peter! Now I just need to see if they are any good. Hmmm, what would go well with Gueuze smoke? Not only am I excited to throw these chips onto the fire but I am also wondering if I can inoculate some beer with them. According to the package the chips come from barrels at Timmermans that were either at the end of their life, or broken. I am not sure of the conditions in which the wood was “chipped” but I tossed a handfull into some starter wort to see what happens. The chips should be full of brettanomyces, pediococcus, kloekera and hopefully saccharomyces (among many other critters). I flushed the starter with CO2 to try to prevent any acetobacter from taking hold. As long as I don’t get any black or green mold I should be able to start up a useable culture, or at least make some interesting vinegar. Of course it would be a lot easier, and probably more fruitful, just to use the dregs from a bottle of Gueuze… but then I couldn’t say that I stuck my wood in it. Jeff, you looking at them for smoking or for beer? There are lots of cool things out there for smoking. I’ve always wondered if any of them are useable in beer, but fear they are not created in sterile enough situations. 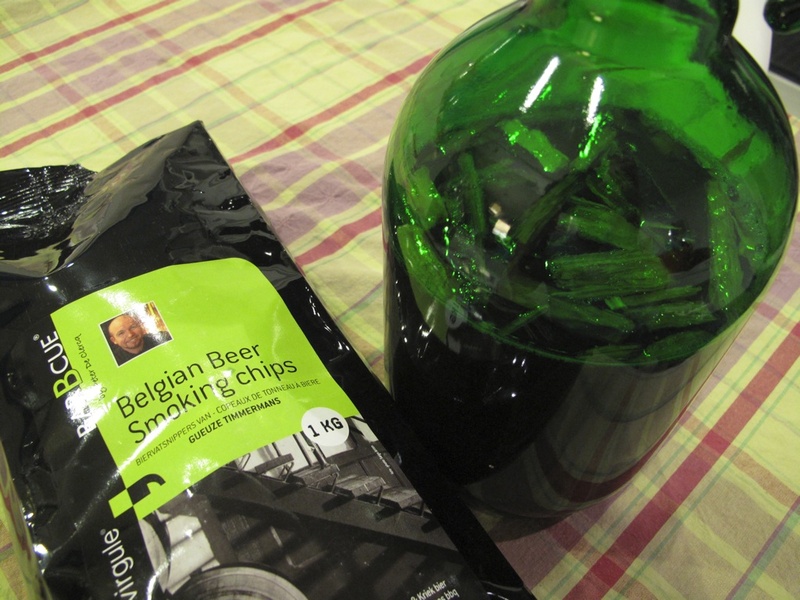 I’ve found some liquored-up chips out there specifically for throwing in beer like wood chips from sherry casks http://bit.ly/ifDCPa or whiskey casks. I have some of the sherry ones but don’t know yet what I want to try them in. that’s a bit cool… can’t wait to grab some, and hear your results..